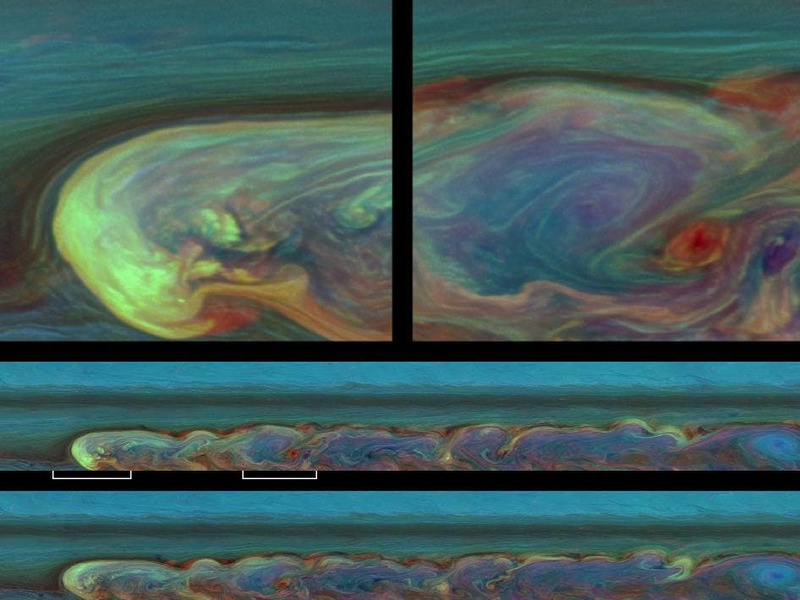 These false-color images from NASA's Cassini spacecraft chronicle a day in the life of a huge storm that developed from a small spot that appeared 12 weeks earlier in Saturn's northern mid-latitudes. It was the largest and most intense observed on Saturn by NASA’s Voyager or Cassini spacecraft. 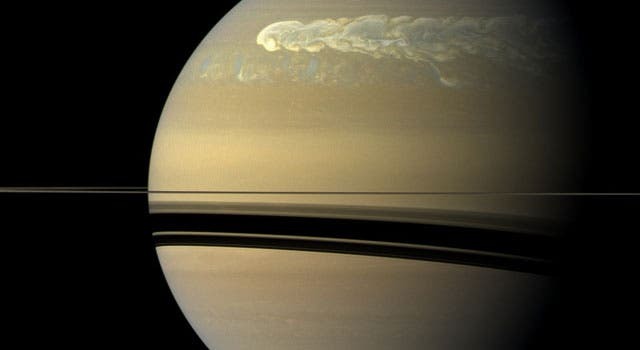 As seen in these Cassini images, the storm encircles the planet – whose circumference at these latitudes is 186,000 miles (300,000 kilometers). From north to south, it covers a distance of about 9,000 miles (15,000 kilometers), which is one-third of the way around the Earth. The storm encompasses an area of 1.5 billion square miles (4 billion square kilometers), or eight times the surface area of Earth. This storm is about 500 times the area of the biggest of the southern hemisphere storms observed by Cassini. Taken about 11 hours — or one Saturn day — apart, the two mosaics below consist of 84 images each. The mosaic in the middle was taken earlier than the mosaic at the bottom. Both mosaics were captured on Feb. 26, 2011, and each of the two batches of images was taken over about 4.5 hours. The images were taken with the Cassini spacecraft narrow-angle camera using a combination of spectral filters sensitive to wavelengths of near-infrared light, acquired at a distance of approximately 1.5 million miles (2.4 million kilometers) from Saturn and at a sun-Saturn-spacecraft angle (phase angle) of 62 degrees. Both the top and bottom images are simple cylindrical map projections, defined such that a square pixel subtends equal intervals of latitude and longitude.